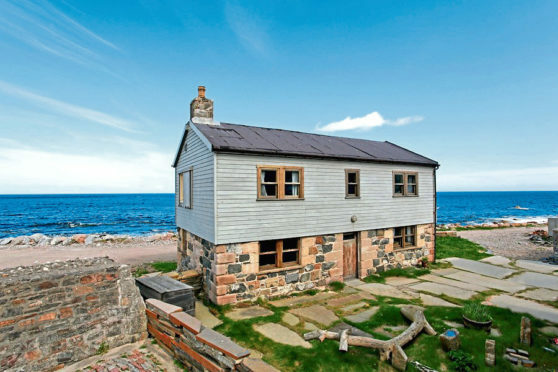 Built just meters from the foamy waves lapping at the shore, The Sailor’s Store commands an exclusive footprint on Cullen’s beachfront, with uninterrupted views of the Moray Firth and beyond. At first glance it may be difficult to pinpoint exactly how old this property is. From afar, it looks different to its traditional neighbours, who stand together in squat terraces with chimneys peeping out. There is an almost Nordic air as you cross the flagstones on the approach, with a hazy blue timber shell encasing the top two thirds of the building. Yet up close, the irregular local stone exposed on the bottom third seems weathered and tough. The oak front door is smooth and sun-bleached, offering a feeling of informal familiarity – as though fishermen for generations have pushed through it daily, arms full of that morning’s catch. Current owner Howard Owens might laugh at such a romantic description of his home, cheerfully informing visitors that the ageless feel of the property is all part of its charm. Built mostly by Howard’s own fair hand, the Seafront House is in fact just 14 years old. Yet it is not the only dwelling on offer here. 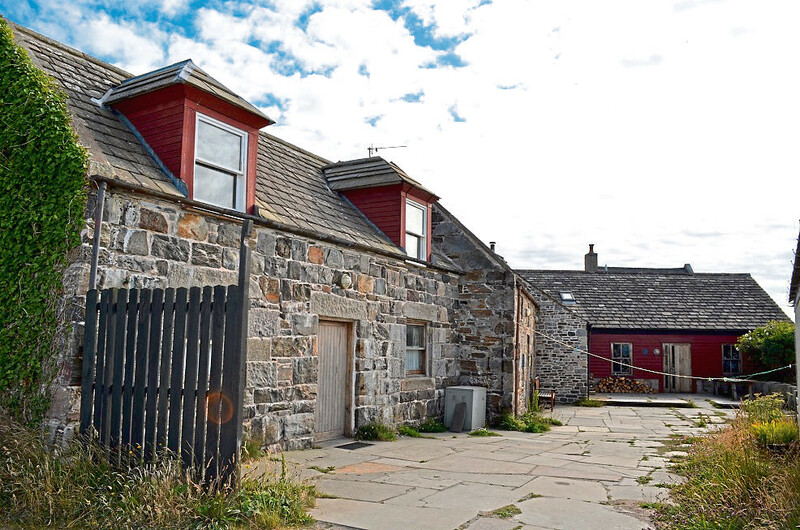 Altogether there are four buildings on the market – The Sailor’s Store, the Seafront House, The Cottage and the Harbour Hostel. “My wife, Ruth, and I built all the properties over a ten-year period,” said Howard, 62. “It was a team effort with Ruth designing and drawing the technical plans for building warrants combined with our joint experience in vernacular building. “When we bought the plot in 1997 it was a derelict site full of scrap metal and rubble. “There was one structure standing on it however, and that’s what we had our eyes on to renovate. “The man who sold it to us described it as The Sailor’s Store, when really it was just an old fisherman’s shed. However, having completed their restoration project, the Owens realised they weren’t quite ready to hang up their tools just yet. 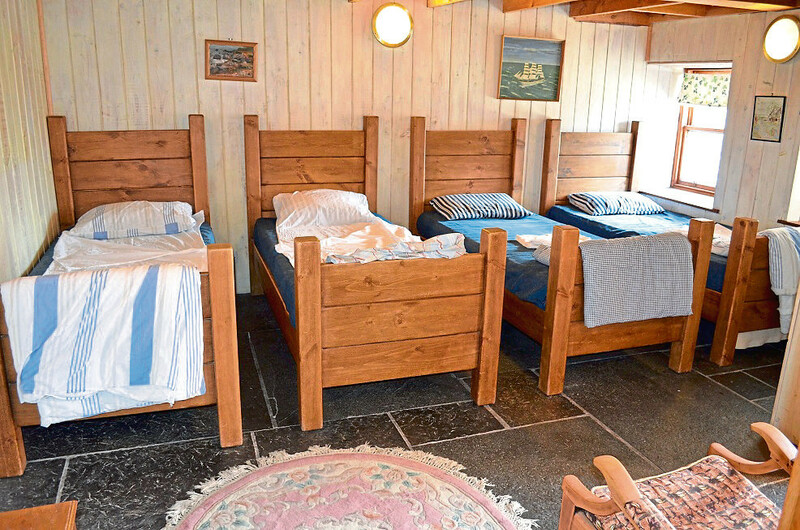 The Cottage came next, then two years later The Seafront House, followed in 2008 by the hostel. 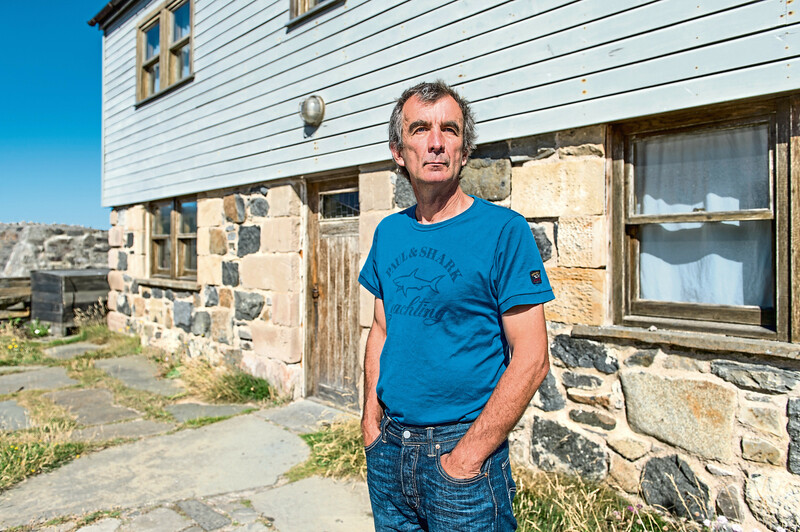 “It was organic really,” said Howard, who runs a business selling Caithness slate. “We never set out to build so many properties but we just had a bug to build and really make something out of the land here. “My wife Ruth was always thinking, and she had the idea of holiday cottages, so over the years that’s what we did. “A lot of people were surprised we got planning permission to build right on the seafront but it was all very smooth actually. An aversion to plastic and other man-made materials led the pair to get creative. Of course, Howard’s business selling Caithness stone came in handy, as did the versatile nature of this material and the local tradition which sees it used for almost anything and everything in the world of house building. 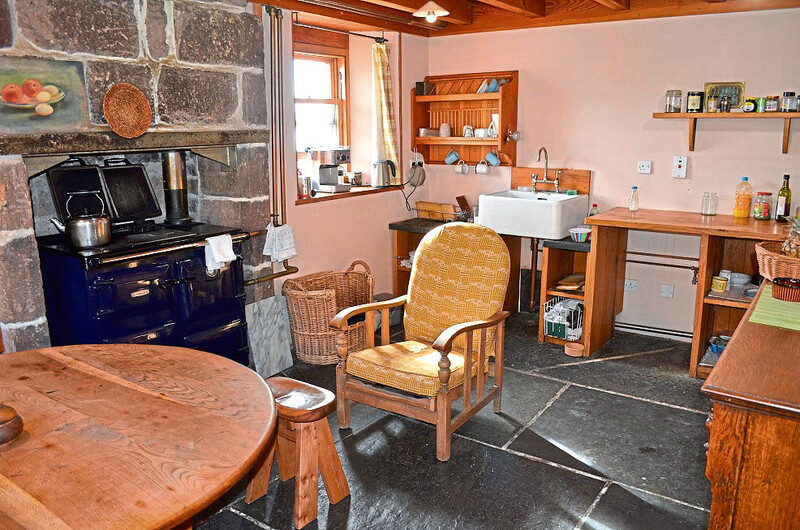 “As well as flooring, we used Caithness flagstones as worktops in the kitchen and shower walls in the wet rooms,” said Howard. “The big stones that form the foundations are massive granite lumps which came out of Inverurie Locomotive works. “All our timber for the rooftops came from the local Forestry Commission. 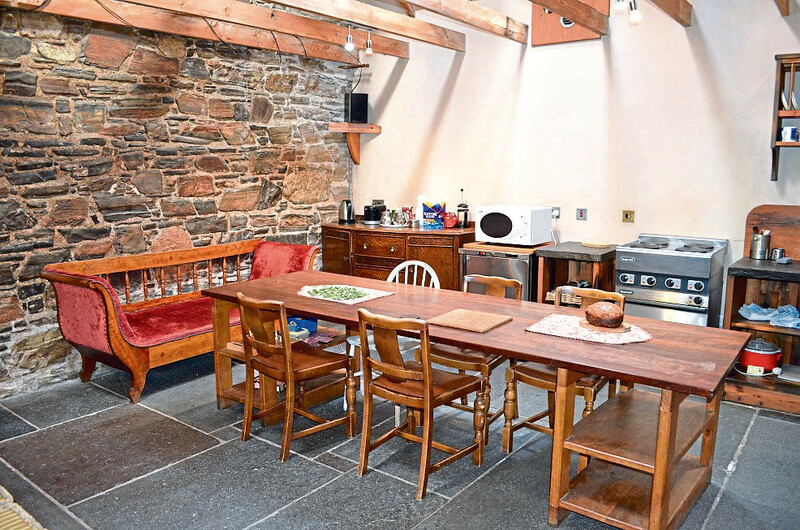 Old whisky washbacks stained with Scotland’s national drink can be found in the property too, while lath – the material used before plasterboard – keeps it all together. Clay drains and cork insulation further avoid the use of plastic, and show the lengths Howard and Ruth went to in order to bamboozle future archaeologists as to the actual period of construction. “It’s impossible to pick a favourite out of the four buildings,” said Howard. “They are all different and each has a story behind them. “Cullen has been the most wonderful place to raise our family, it’s a great environment to live in all seasons – winter is exposed and bracing, whereas summer can be amazingly calm and serene. However, with his children now grown up and for the most part doing their own thing, Howard has found himself nearing the end of an era. “I believe that there are certain chapters in your life,” he said. “My wife Ruth died recently and to me it doesn’t feel right to carry on what we did together alone now. “And with all the children gone it feels far too big to be here myself. “I’m hoping the sale of this place will release funds for a new project I can start somewhere else. Offers should be made in the region of around £550,000. Contact Walter Gerrard & Co on 01261 832491.